The Rockport Film Review: "Maniac (1980)" is Completely Insane! 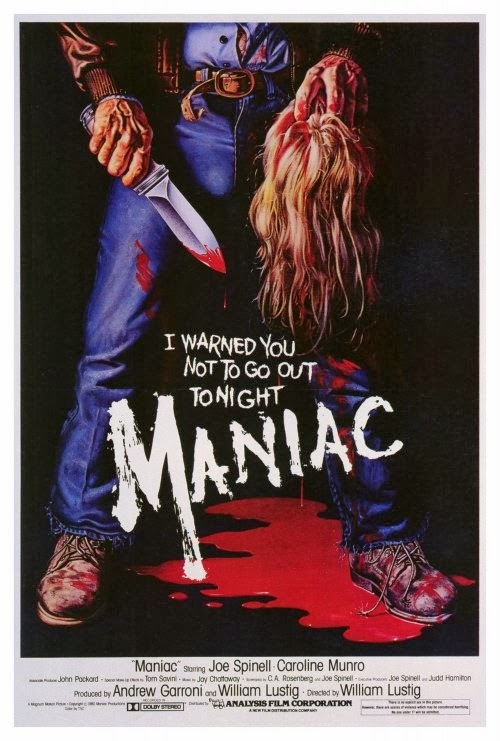 With it's off the charts creep factor and brutal violence, the low budget 1980 slasher "Maniac" was an early classic in a decade of memorable horror films. 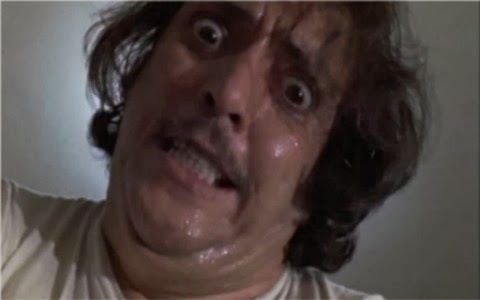 What makes this film so utterly disturbing is the performance by Joe Spinell as Frank aka the Maniac. His homely look and doughy physique give him a very relatable everyman kind of quality. He walks beside you on the street and is unnoticeable in a crowd, but he is completely and utterly insane. Frank Zito lives in a small apartment with a bunch of female mannequins which he dresses up with his victim's clothes. As a final touch, he scalps his victims and nails the bloody matted hair to the bald mannequins. The creepiest element of the movie is its use of sound. We constantly hear Franks heavy breathing like some obscene phone call. His rambling thoughts are played as a voiceover on a number of scenes. You are literally in the mind of a killer. Like a lot of movie madmen, Frank has serious mommy issues. His mother was a prostitute who brought numerous men into their apartment to conduct her business. Frank was also beaten and abused as a child. When his mother dies suddenly in a car accident, it sends Frank over the edge into madness he will never come back from. His victims are primarily prostitutes who he gleefully strangles and scalps. One day in the park he meets Anna, a fashion photographer, who shows an interest in him. He sees Ana as his one last shot at a normal life. He is a perfectly charming gentleman around her, but how long can this last? Apparently not for long as he dispatches one of her models while she's taking a bath in her unlocked apartment. Talk about making it easy for him. The special effects were done by the legendary Tom Savini who has the bizarre job of making his own head explode. He has a small acting part in the film credited as "Disco Boy" along with "Disco Girl" are making out in a parked car when the Maniac starts peeping. He eventually hops on to the hood and shoots him point blank in the face with a shotgun. Savini's head explodes in a gruesome slow-motion scene that foreshadows a scene to come in Cronenberg's film "Scanners". Unable to control the crazy beast within Frank loses Anna and falls into a sort of death spiral. "Maniac" is truly a carnival of insanity all the way to the gory end!